(Lanham, MD) Deborah Scott Thomas, President and CEO of Data Solutions & Technology Incorporated, congratulates Dr. Gwendolyn E. Boyd, newly elected president of Alabama State University (ASU). Dr. Boyd took the helm of the university on Saturday, February 1, 2014. 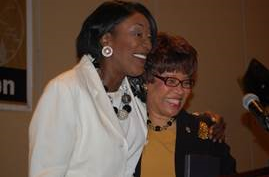 “I’ve known of Dr. Boyd’s great leadership attributes since our days at Alabama State University. I’m certain she will carry this reign with dedication, diligence and authority. She is the best person to take the university to the next level,” states Thomas. Dr. Boyd has always been an outstanding role model to those in academia. In 1979, she became the first black woman to graduate from Yale University with a degree in engineering. 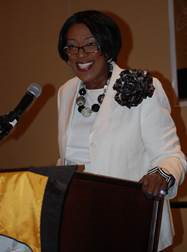 She received a Bachelor's degree in math from ASU as well as a Master's degree and a Doctorate in divinity from Howard University in Washington, D.C.
Data Solutions & Technology wishes Dr. Boyd success as President of her Alma Mater– Alabama State University. Data Solutions & Technology (DST) Incorporated, is a Veteran-Owned, Woman-Owned business with 20 years of high level management experience. DST provides a full spectrum of Business Process Solutions, Network Solutions, Management Solutions, Acquisitions & Logistics Solutions, Healthcare Solutions and Research and Development Solutions. DST helps customers determine how to maximize their output and works with them to achieve their goals, while improving their operational performance. To learn more about DST, visit at: www.dstincorporated.com. Founded in 1867, in Marion, Alabama, as a school for African-Americans. The school started as the Lincoln Normal School with $500 raised by nine freed slaves now known as the Marion Nine, making ASU one of the nation’s oldest institutions of higher education. Today, Alabama State University, located in Montgomery, Ala., is an institution of higher learning which welcomes students from around the world. ASU offers nearly 50 undergraduate and graduate degree programs. To learn about ASU, visit at: www.alasu.edu.